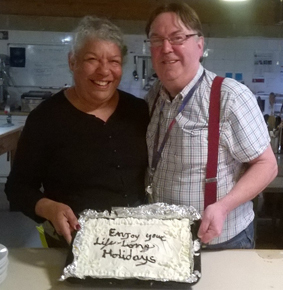 Over the last week we have bid farewell to Dave and Sandra, who have worked at Othona for the last three years. They have made a huge contribution over this time and will be sorely missed here. They are off for new adventures in Nottingham and we wish them well in this exciting move. Fortunately they will be back again in the summer but this time to relax. Then it was time to say goodbye to all of our wonderful EVS volunteers who have worked here for the last year. Yannis, Anouk and Tosca have worked really hard during their time here and been great fun to have around, we will miss them. They are all returning home for the summer (Greece, France and Italy) but thankfully Tosca is coming back to volunteer again in the summer.